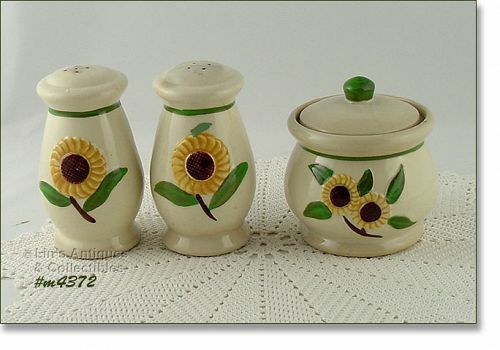 These little Shawnee planters are so cute! It’s a maroon color truck and a yellow color trailer. 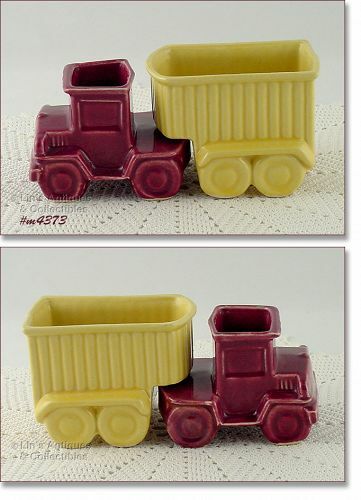 The little truck is marked 680, Shawnee, USA, measures 3 1/8” tall (at tallest), and 3 1/8” wide (at widest). 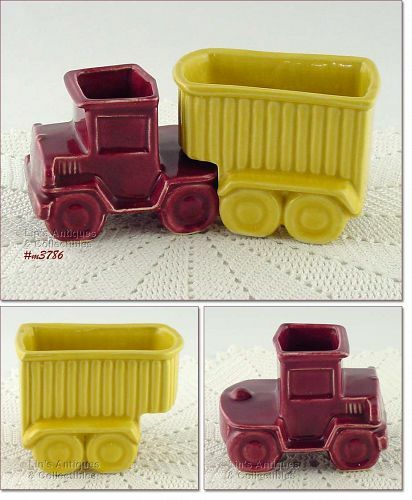 The little trailer measures 4 ½” long (at longest), 3 3/8” tall (at tallest), and 3 1/8” wide (at widest). Bottom is marked Shawnee, USA, 681. 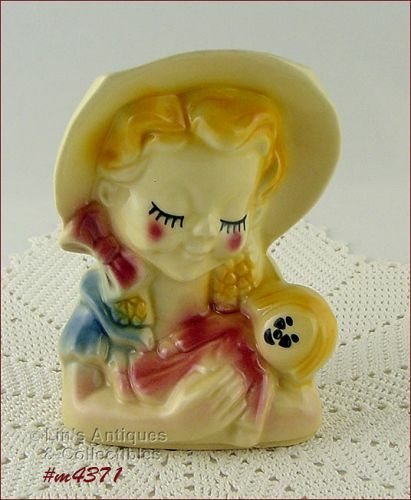 Excellent condition Shawnee wall pocket -- this is the little girl “holding” her doll. Wall pocket measures 6 3/8” tall (at tallest) and bottom is marked USA, 810. Wall pocket looks new and unused! This is a super find – a large Shawnee jardinière with petal tips! 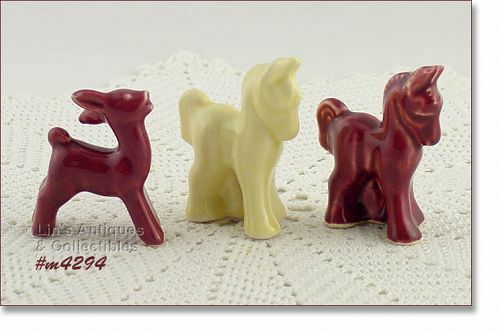 Difficult to find, I have only had one of these and it was the much smaller size. 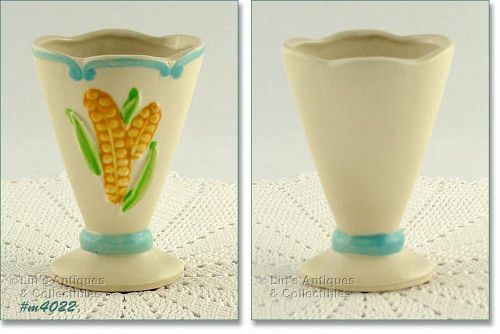 This one measures 7 ½” tall (at tallest), 8 ½” wide (at widest) and bottom is marked USA 709. The color is beautiful and it is in excellent condition with all points intact! Don’t miss this one -- it's gorgeous! This listing has an excellent condition Shawnee planter! It’s JoJo the clown and bottom is marked U.S.A. 607. Planter measures 4 ¾” long (at longest), 3 ½” wide (at widest), and 3 ¼” tall. 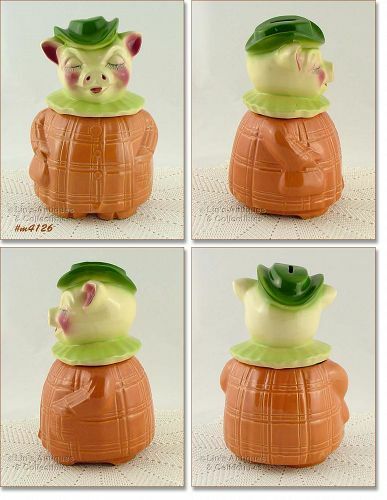 Beautiful planter with gorgeous colors and mold detail! 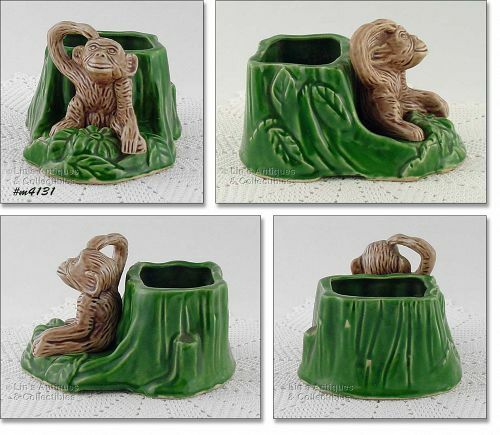 This listing has a Shawnee monkey by stump planter – one of Shawnee’s more difficult to find planters! It is in super condition with no chips, cracks, or dings. The back rim edge and back have a few production color skips. It is an excellent addition to any collection! We purchased this Shawnee combination cookie jar/bank at an Indiana estate sale and it is truly a treasure to add to a collection! Winnie is in excellent condition – unbelievable – no nibbles at the coin slot (I don’t believe the bank portion was ever used). 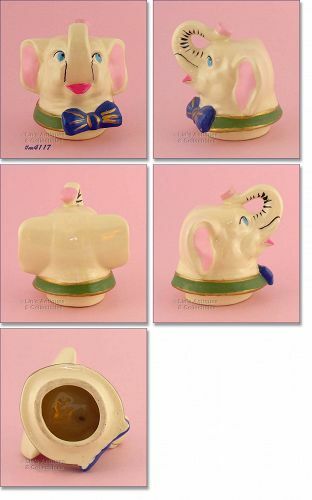 I purchased this Shawnee cookie jar lid at an Indiana sale – this is a lid for the “Lucky” elephant cookie jar! It is in very good condition but it appears that prior owner has painted/re-painted the ears, collar, etc. Other than that, lid is in wonderful condition with a glaze bruise on underneath side of bow – not detrimental in any way. This is an absolutely beautiful Shawnee vase with gold trim! 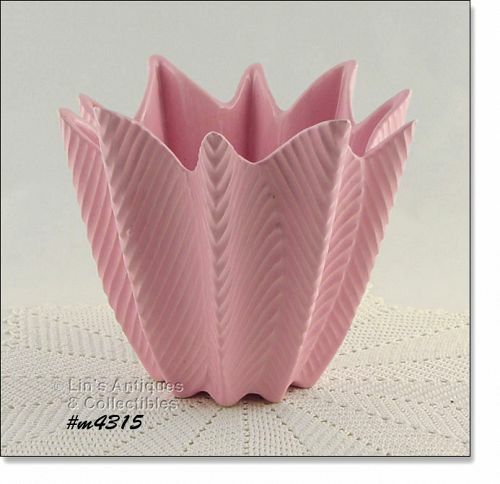 Vase measures 6 ¾” tall and it’s in excellent condition. Super! 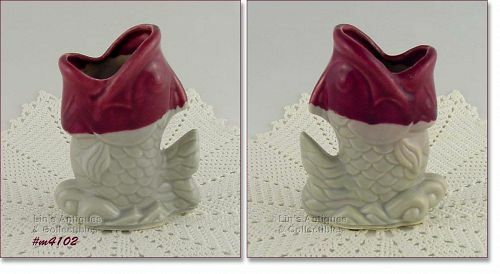 This listing has an excellent condition Shawnee fish shaped planter! It measures 5” tall (at tallest) and bottom is marked USA, 845. Gorgeous colors and mold detail! I love the Shawnee roly-poly round shaped animal planters and try to purchase them whenever I find them! This one is a little elephant – very colorful in purple and green. Bottom is marked USA, 159. Planter has been used as intended and has light interior staining – not detrimental. 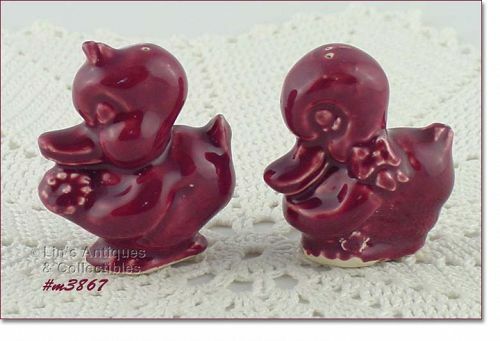 This little Shawnee duck figurine has been displayed (along with some McCoy little duck planters) on my kitchen window sill for many years! 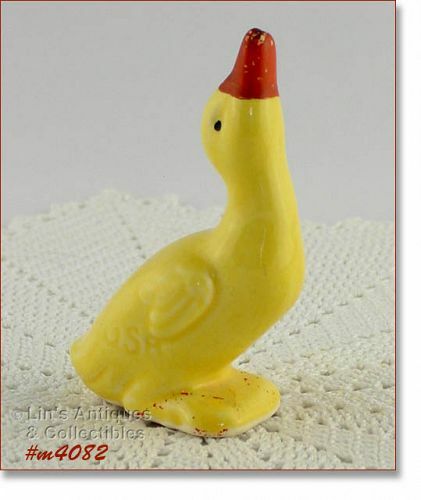 Little duck is adorable and is in excellent condition – has very minor crazing – that’s it! Ducky measures 4 ¼” tall (at tallest) and is marked USA. 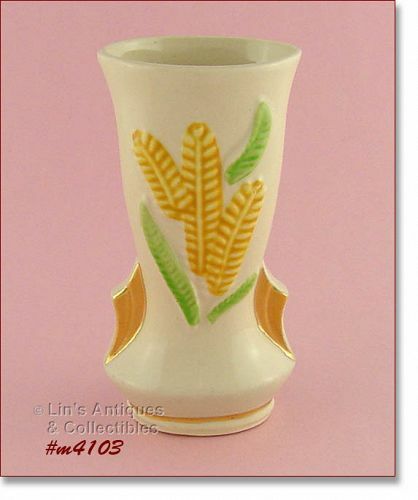 Shawnee produced such pretty items and this little vase is a perfect example! 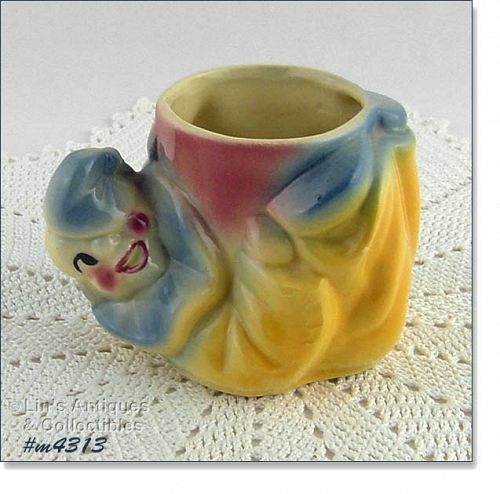 It measures 4 ¾” tall, bottom is marked USA, and it’s in excellent condition – looks new and unused. Excellent condition Shawnee planter! This is the fawn (deer) standing in front of a stump shaped planter. 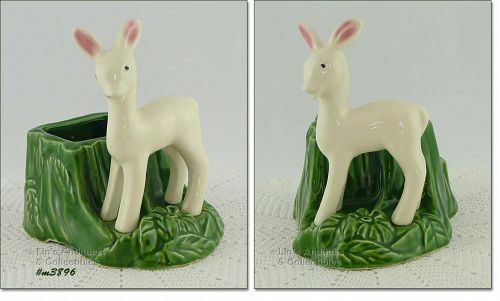 The white deer is not your everyday find – the colors and detail on this planter is simply outstanding. Planter appears new and unused!